Well, in a matter of minutes, that question was certainly addressed. 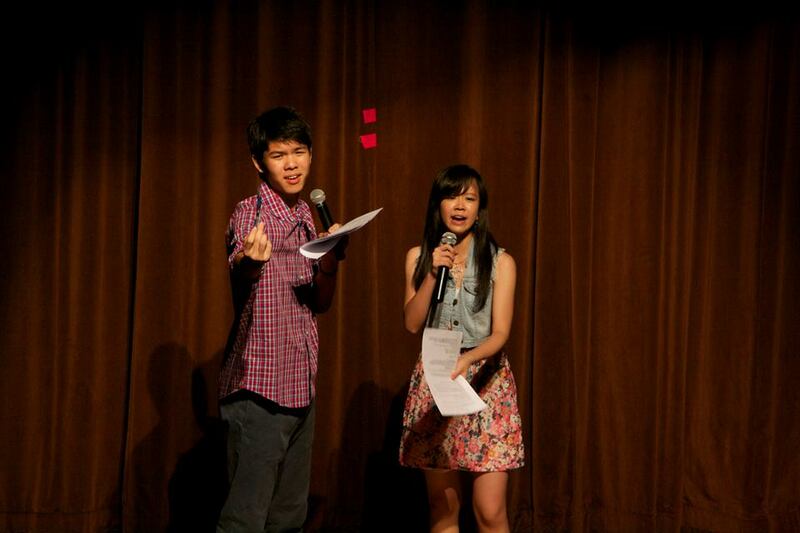 As emcees Simon Ang and Tiara Sadikin quipped, these people certainly could do amazing things with their mouths. Setting the tone for the night was Vox! 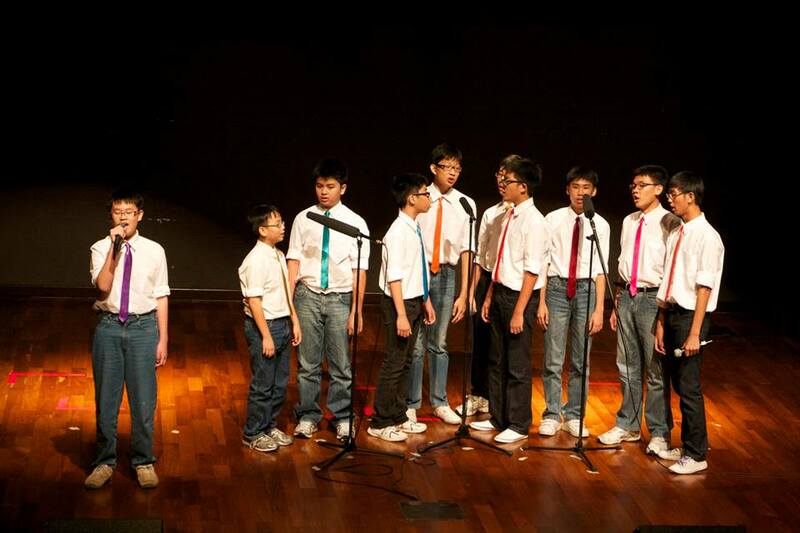 a Year Five a capella group comprising Marc Leong, Lim Jin Jie, Chua Zijian, Vivek Kai-wen, Melvin Ng and Oliver Chan. To say they got a warm welcome would have been an understatement, for they received a raucous reception from the audience. Peppered with catcalls and shouts of the members’ names, the crowd was definitely hyped up by the time Vox! broke into their opening number. With Melvin first taking the lead role, they performed a medley of Justin Bieber’s “Baby” and Frankie Valli’s “Can’t Take My Eyes Off You”. They then proceeded to charm the crowd with covers of Louis Armstrong’s “What A Wonderful World”, Toploader’s “Dancing In The Moonlight” and even a Japanese song, TRY-TONE’s (A Capella de Yukou), finally ending with their rendition of David Guetta’s Titanium, which was spiced up with a little choreography. With signature brightly colored trousers and an upbeat performance, Vox! livened up the stage and got some audience moving along to their beats. Where Vox! roused the audience, the next team calmed and moved them. Consisting of Yang Sin Yee, Daphne Quek, Lee Wan Yii and Tabitha Ng from Year 5, 无名氏 (meaning ‘Anonymous’) made for a heart-warming, uplifting performance. They performed a number of Mandarin hits, including F.I.R.’s “天天夜夜”(Day & Night), Harlem Yu’s“情非得已”，and Ocean Ou’s “孤单北半球”. Through the performance, the audience seemed soothed by the sound of Anonymous’ serenading. Finally, capturing the spirit of the evening (and their bilingual ability) was their final piece, ‘It’s a Beautiful Day’ by Michael Bublé. Special mention goes out here to Bryan Ang (more popularly known as BANG) for his splendid beatboxing during 无名氏’s performance. Matching outfits and well-practiced routines made for a coherent performance. Such polished performances could not have been put together without much behind-the-scenes effort, though. Vox! practiced about 7~10 hours a week, while 无名氏 practiced 3~4 times a week, for 3~4 hours each. The first half of the evening concluded with a splendid showing by the V.O.calists, which consisted of Hwang Kai Wen, Chua Zijian, Letitia Chen, Shankar Tamilselvam and Isaac Teo. 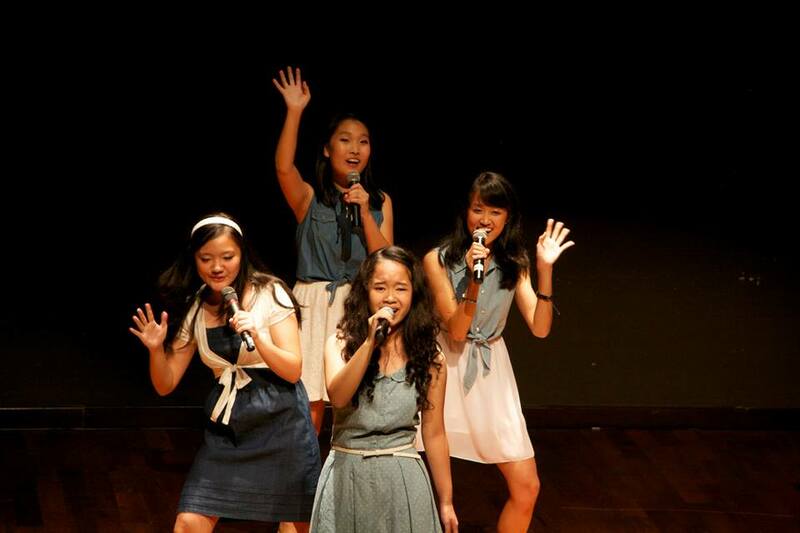 The quintet was RI’s first cross-batch a capella group when it formed in 2010, comprising members from both the Year 1-4 and Year 5-6 side of the school. Visually and audibly stunning, this group performed the likes of BIGBANG’s ‘Haru Haru’, Kings of Leon’s ‘Use Somebody’ and McFly’s ‘Love Is Easy’, prompting many members of the audience to sing along or bob their heads to these popular and catchy tunes. However, their performance was tinged with sadness, as Kai Wen announced that the group was disbanding due to its members’ other commitments. Matching, sombre outfits in black and white. Closing their performance was a haunting medley of “Fix You” by Coldplay and “If I Lose Myself” by OneRepublic, which ended amidst thunderous applause from the appreciative audience. Being able to watch such a well-groomed group’s swan song was definitely a privilege for us, and we left for intermission with the ghosts of their harmonies echoing in our heads. The next half of the evening kicked off with another pun from our dynamic emceeing duo, drawing a mix of laughter and groans from the audience. We were treated to an amusing sight of Tiara beating a box in an attempt to hint at the subsequent performance; a Beatbox Battle between Isaac and Kai Wen of the V.O.calists. They managed to replicate the sounds of various musical instruments, from kick drums and snares to trumpets and electric guitars, stunning everyone. Tabitha Foo of the audience was especially impressed, exclaiming about how “cool” the duo were. 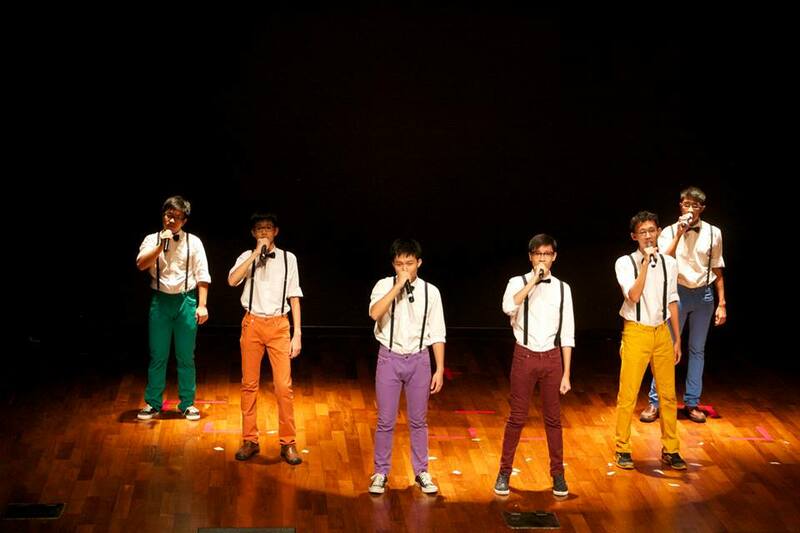 We were then entranced by a performance by Nuance, a cross-batch a capella group. Nuance consists of RI boys from Years 2 to 4; namely Anthony Wu, Adrian Wang, Lim Ziwei, Joel Yeap, Teo Qixuan, Ryan Han, Ryan Heng, Christopher Chia, Benjamin Ang and Clevereno Darini Sam Wei Jie. Squeals and exclamations of “So cute!” from the audience, especially when soloist Christopher Chia took the mike and enchanted the audience with his fresh, youthful voice, were abound as they took on the sounds of ‘Demons’ by Imagine Dragons, ‘Without You’ by David Guetta, ‘Carry On’ by fun., and ‘Trespassing’ by Adam Lambert, injecting youthful flavour and energy into these tracks. Finally, the audience was treated to a collaborative piece between all the performers and students of the Grace Orchard School in a deeply moving rendition of Nick Lucas’ ‘Side by Side’. Autism does not equate to inability, and these children were living testament to that. Despite living with intellectual disabilities or mild autism they pulled off the performance with praiseworthy showmanship, brightening up the amphitheatre with their wide smiles and leaving the audience with pleasant vibes to end the night. Appena La Voce would not have been possible without the commendable efforts of this year’s OrgComm; Oliver, Zijian, Jin Jie, Vivek, Melvin and Marc. When asked about the experience of organizing 2013’s Appena La Voce, Zijian revealed that “It’s the first time any of us has handled anything of this calibre… it was a slightly longer than six month planning process, from concert naming to beneficiary searching to logistical support, every single step bringing us closer and closer to the concert itself”. Nevertheless, they managed to accomplish a splendid showing; kudos to them! All in all, it was a great evening. 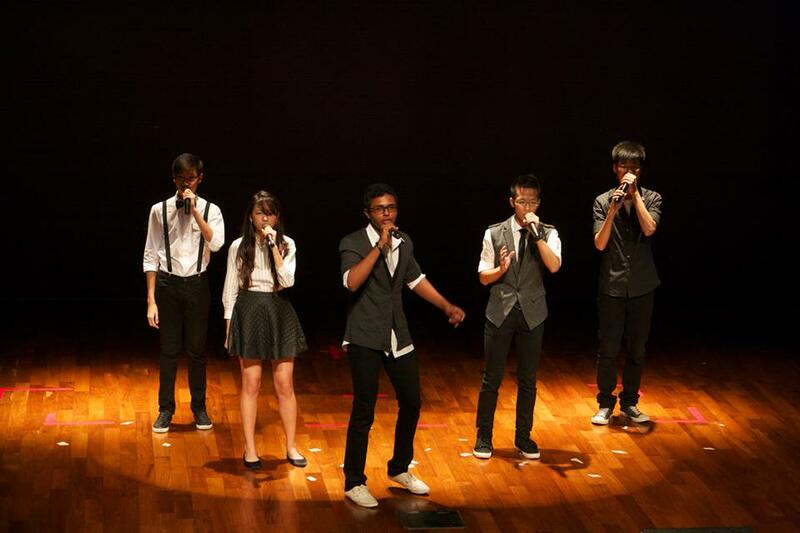 Coupled with the quality performances put up by our very own home-grown a capella groups was the cheerful, light-hearted atmosphere brought about by Simon and Tiara from their tirelessly enthusiastic emceeing. Just ten dollars for a night of good fun, good music, and all for a good cause—raising funds for the Grace Orchard School— what’s not to like? 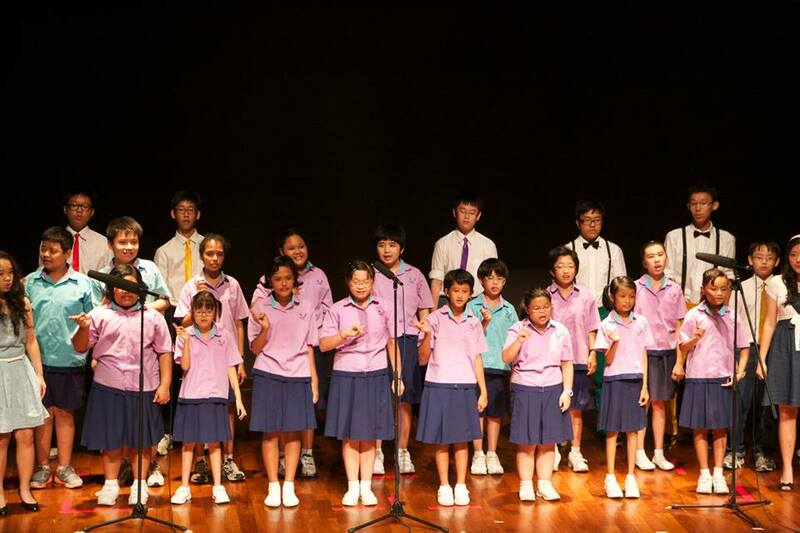 We at Raffles Press are definitely looking forward to next year’s Appena La Voce! Finale performed by students from Grace Orchard School & all other performers. Big shout out to the Backstage crew without which the show wouldn’t have been possible!